Whenever you create a custom search in Content Station and subsequently log out of Enterprise, the custom search is saved to Enterprise. It is then possible for the system administrator to make this search available to other users or user groups so that they can make use of this search as well. Tip: This is a good way of sharing custom searches made by power-users and/or to share types of searches that are often used such as a search for locating recently modified files. For more information about creating a custom search, see Searching for files using Content Station 9. Step 1. Access the User Queries Maintenance page. Choose User Queries in the Maintenance menu on the left side of the screen or on the Home page. Step 2. From the User list in the Source section, choose the user who's queries need to be copied. All created custom searches for that user appear in the Queries list. The application in which the custom search was created is shown in brackets. Step 3. Select the queries that need to be copied. Step 4. 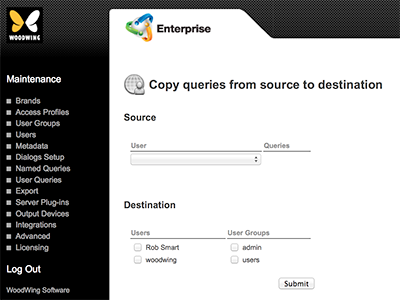 In the Destination section, choose the users and/or user groups to which the queries need to be copied. The result of the action is shown on screen.